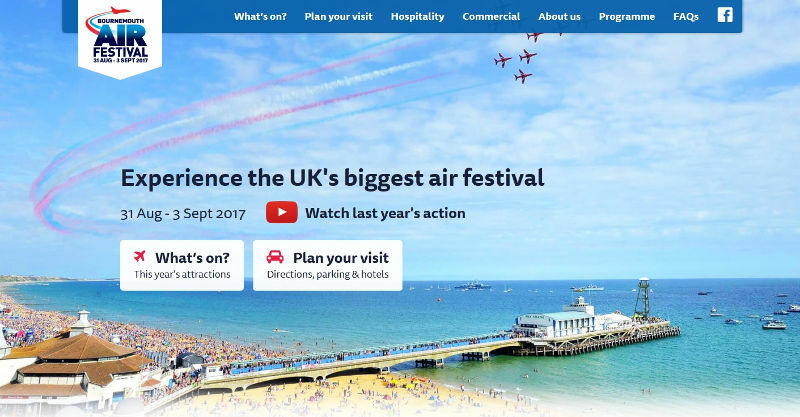 In celebration of this summer’s 10th Air Festival, organisers have partnered with local digital agency Createful to redesign and build a new look website, bournemouthair.co.uk, intended to embrace the event’s unique festival atmosphere. For use on mobile, tablet and desktop, the website utilises stunning visuals from past festivals and a striking colour scheme incorporating red, white and blue. The new interface is easy to navigate and user-friendly with tips on how to plan your visit, option to pre-order this year’s bumper souvenir programme, purchase hospitality tickets and, once available, access to the live flying display schedule. With more than 1.2 million webpage visits during 2016 it is imperative that the site is not only mobile friendly but also built to handle high volumes of visitor traffic. Createful have ensured the website is extremely lightweight to avoid slow loading times by using a number of digital techniques including auto-scaling and caching content. 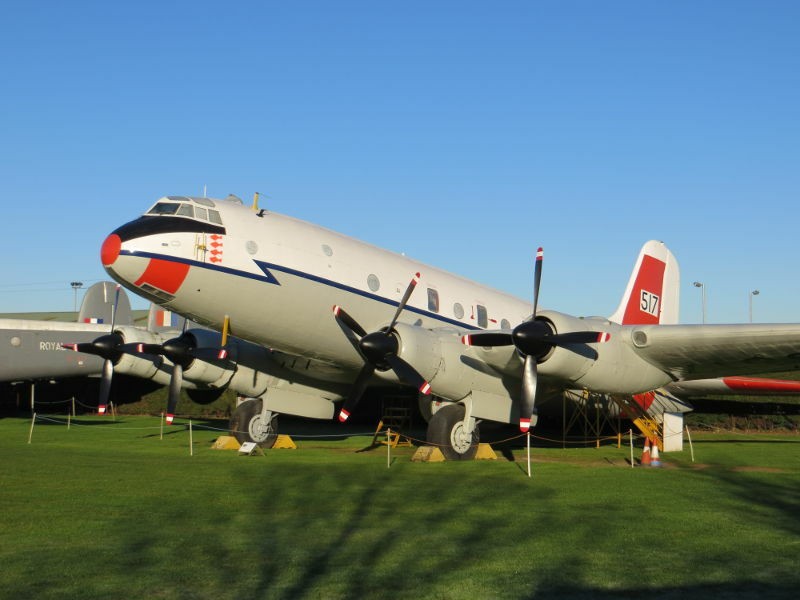 Preparations for the Hastings & Shackleton 40th Anniversary Weekend are now well underway at Newark Air Museum’s site in eastern Nottinghamshire; close to the border with Lincolnshire. Newark Air Museum is a registered charity that is located on part of the former site of RAF Winthorpe. 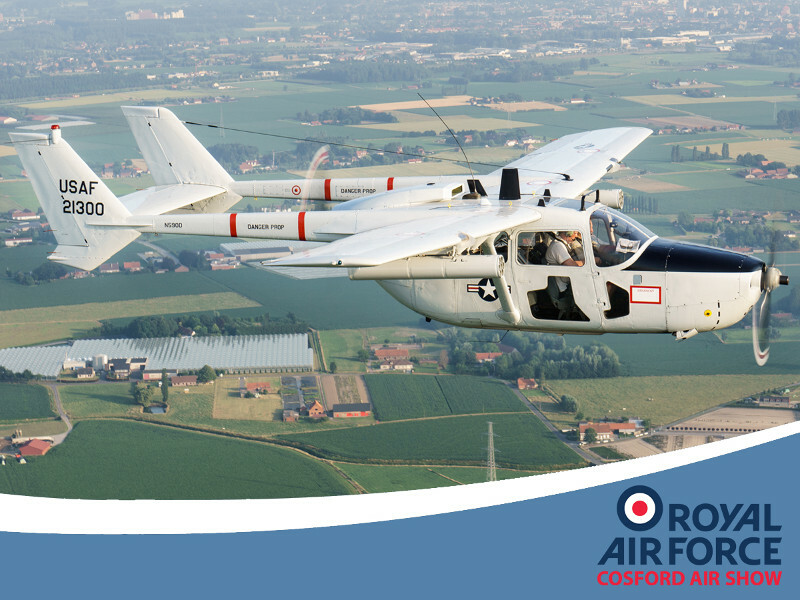 This is an open cockpit style event that will be used to commemorate the 40th Anniversary of these two aircraft arriving at the museum. It will take place on Saturday 20th & Sunday 21st May 2017 from10am until 5pm each day (last admission at 4pm). The Shackleton was dismantled and moved to the museum by road in spring 1977, in what remains the largest aircraft dismantling project ever undertaken by the museum and its volunteers. While later in the summer the Hastings was flown from RAF Scampton to join the museum collection. Both aircraft remain firm favourites on the museum’s cockpit opening rota and admission normally costs a small additional fee. On this weekend access to both aircraft will be FREE, but as ever donations would always be welcome to aid the museum’s fund raising efforts. The Ashton fuselage that is also part of the famous Avro lineage will also have free access on both days and it will house a model display of Avro airframes. Adults £9.00, Over 60s £8.00, Children £4.50 and Family ticket [2 adults & 3 children] £24.00. Please telephone 01636 707170 if you require any further information. Robots take centre stage at Brooklands Museum! Brooklands Museum Staff have once again stepped up to the challenge, wound up the gramophone and discovered their inner dancing robot around the Museum site to Daft Punk’s hit Harder, Better, Faster, Stronger. The video, featuring Staff, Volunteers and the Museum’s own mascot, Bertie Bear, has been entered into the annual international Museum Dance Off Competition. The competition is now in its fourth year and sees 41 Museums from around the world compete in three rounds to be crowned winner of Museum Dance Off 4: A New Hope. After reaching the quarter final of the competition last year, there are high hopes that this year’s entry will make it all the way through to the International Thunderdome Final. Despite a Harder task this year of taking on fellow local competitor, Egham Museum, the Museum’s dancing crew are looking Better than ever before, and believe that this year’s entry will shoot to the top Faster, but to achieve this the Museum will need to get even Stronger support from all its supporters. 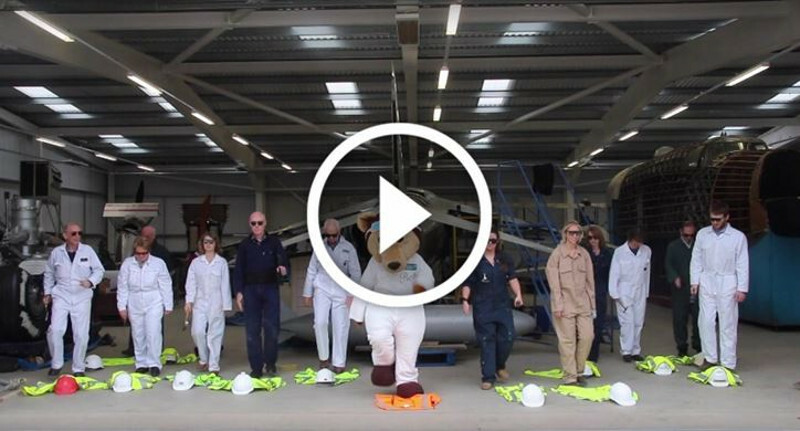 Themed around the Re-engineering Brooklands work taking place at the Museum, the video follows the dancers on an exploration of the exhibits currently being worked on, with a grand finale in the newly reconstructed Bellman Hangar. The competition will take place in three rounds, across the next few weeks. The first two rounds are done by region, and Brooklands Museums will be going up against Norwegian entry MiA, museene i Akershus and fellow UK entries The Old Operating Theatre Museum and Herb Garret, Aberdeen Maritime Museum and Egham Museum. The winner of each round is decided by public vote, but voting is limited to a 24-hour time slot of between 1pm on Wednesday 26th April until the same time on Thursday 27th April. Votes can be cast at www.whenyouworkatamuseum.com, where all the entries can be seen, or just search for ‘Brooklands Museum Dance’ on YouTube to see what a fantastic routine has been created. In May and June, the Museum will be hosting several exciting FREE lectures as part of our 2017 Research Programme. Visitors to this year’s RAF Cosford Air Show can once again be transported back in time as the popular Vintage Village returns on the showground, bigger and better than ever before! This year’s live stage pays tribute to the stars of the 1960s with a great mix of performers. Themed food and drink outlets including Lily’s Secret Vintage Tea Room will help set the atmosphere. There will be a chance to reminisce in the Kids Fun Zone, try a spot of retail therapy with a host of Vintage trade stalls and test your skills at the 1966 World Cup penalty shoot-out! Traders interested in booking a pitch for the Vintage Fair should email averyvintageevents@gmail.com for further details. A host of motor enthusiasts will be in attendance with some fantastic vehicles including the RAF Mini Club bringing along some wonderful examples of the iconic 1960s brand. Aircraft enthusiasts will not be disappointed with the static line-up planned for the Vintage Village including a number of iconic aircraft from the period including an O-2 Skymaster and Jet Provost. New for this year will be a cockpit sections display, with exhibits to include a cockpit from an English Electric Lightning. 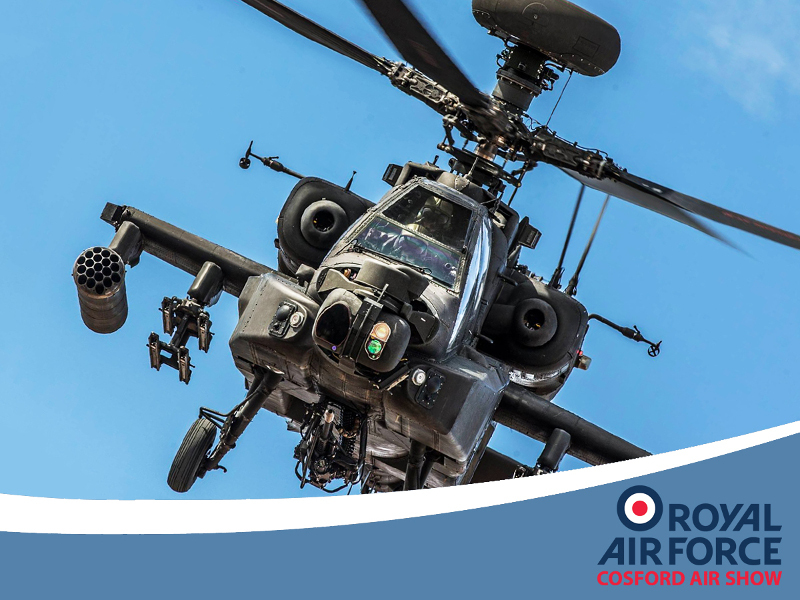 RAF Cosford Air Show is a fantastic family day out with something for everyone to enjoy. Tickets are on sale now and organisers are encouraging attendees to purchase their tickets soon as the Air Show is, once again, an Advance Ticket Only event. Adult tickets cost £25.00 and accompanied under-16s enter for free. 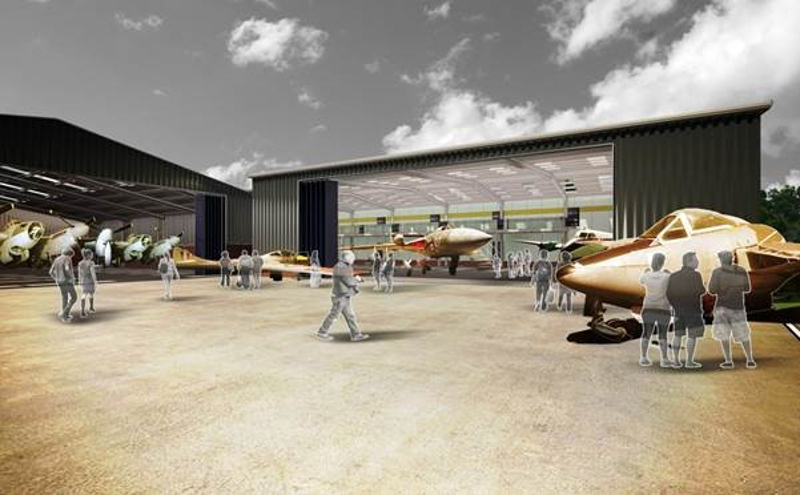 The de Havilland Aircraft Museum’s project is to request donations to “match fund” a grant from the Heritage Lottery Fund which will enable the Museum to build a new Hangar. The New hangar will incorporate a Learning Centre and Event space which will enhance our visitor experience. The New Hangar will allow the Museum to reposition most of its collection under cover enabling critical restoration work to be completed. As the New Hangar will be connected to existing buildings it will allow the Museum to extend its open season. The Scampton Airshow, staged in aid of the RAF Charitable Trust, will be held at RAF Scampton – the Lincolnshire home of the Red Arrows – from September 9-10. The diverse, family-friendly event will encompass an impressive five-hour flying display, complemented by an array of entertainment on the ground, from a nostalgic Vintage Village through to interactive and engaging STEM exhibits in the Techno Zone. 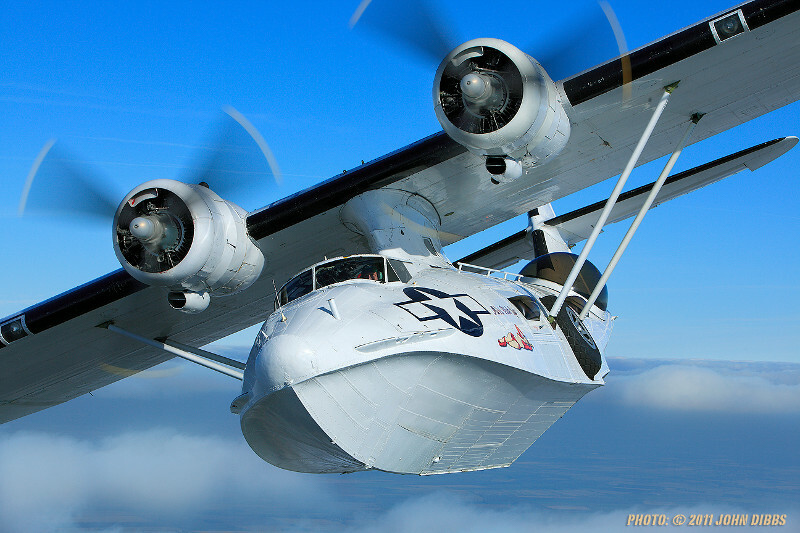 Compass Travel (Sussex) Ltd have confirmed their support of Wings & Wheels again by providing their invaluable public bus service from Guildford Train Station to Dunsfold Aerodrome. The success of last years’ service saw the Compass Team handover a cheque to Help for Heroes for £620 this week and confirm that visitors will have the option of public transport to and from the Show again four times a day. 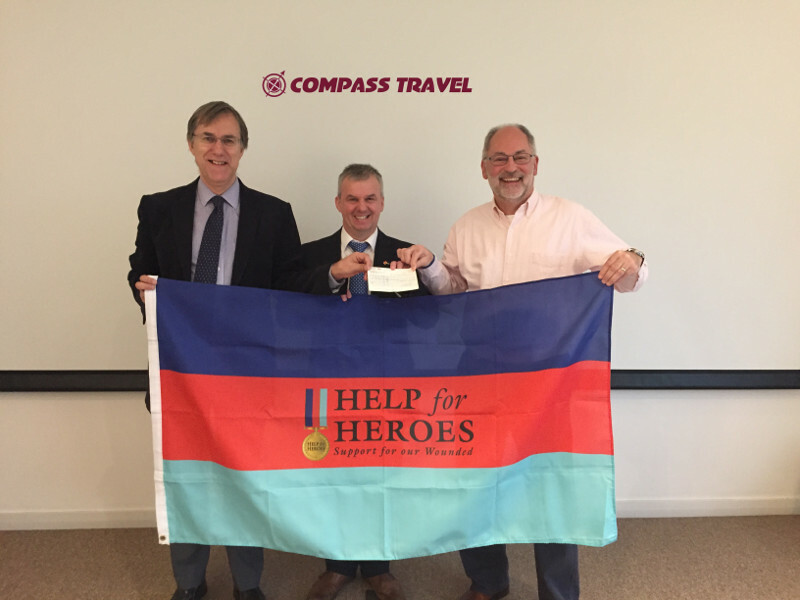 Presenting the cheque to James Burns, Help for Heroes Regional Manager (London & South East), was Chris Chatfield, Compass Travel Managing Director, and Joe Beckley, Compass Travel Operations Manager. Tickets can be purchased in advance online through the Wings & Wheels shop (www.wingsandwheels.net/shop). A single fare for an adult is £2.50 and £1.50 for a child aged 5 – 15 years. Each bus carries 44 seated passengers and 27 standing. Seats will be available on a first come first serve basis over the event weekend. All profits from the 2017 service will be donated to Help for Heroes. Visitors to Wings & Wheels can also enjoy the full complement from the RAF as they display with the Red Arrows, Eurofighter Typhoon and Battle of Britain Memorial Flight (two Spitfires and Lancaster) air displays. More aviation displays will be announced in May. For motorsport fans, supercars and classic and vintage icons put on an awe-inspiring display of power and speed on the Top Gear track in a two hour auto spectacular from Brooklands Museum. Over in the Wheels Zone you can expect an array of interactive and static displays as wells four wheeled shows in the Stunt Zone and a Monster Truck arena offering demonstrations and passenger rides. The show also includes over 25 fixed-price catering outlets, two bars, hospitality facilities, free on-site parking, public camping, lost children point, disabled access, informative show commentary, opportunities to meet the pilots, official show merchandise and grandstand seating. Advanced rate tickets from £22 for adults or £50 for a family are available. A family ticket consists of two adults and three child’s tickets. Single child tickets (for children aged 5 – 15) will be £7, whilst children under the age of 5 go free. Hospitality packages start from £155 per person, weekend passes, grandstand tickets and camping are also available. For more information visit www.wingsandwheels.net or to book standard tickets call 08712 305 572.